Scouting offers fun and friendship, challenge and everyday adventure to 400,000 girls and boys across the UK. 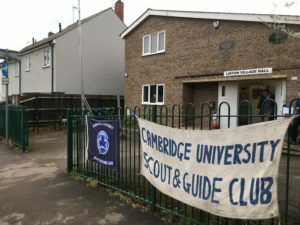 The 27th Cambridge Scout Group is based in Cherry Hinton and offers young people the chance to make new friends, have fun, and learn new skills and activities. We offer groups for Beavers, Cubs and Scouts. This Saturday, 9th of March, the 27th Cambridge Scout troop headed to Linton Village Hall, to take part in a hike. There were 42 teams at the event in all, and there were eight points to get through (A,B,C,D,E,F,G,HQ). We all started from different points at different times, with an interval of ten minutes between teams. At B,D and F there were activities, at the others was an unmanned cone where you had to pierce the mark sheet. For Base B you had to complete a logic puzzle in which you had to move a stack of rings but could not place a bigger ring on top of a smaller one. Base D was another logic puzzle, where you must retrieve ducks which are out of reach, and you are given equipment such as a baseball, two small lighter balls, a pair of oven gloves, three pieces of rope, a water gun and a spade. At Base F we had to deal with a first aid situation, one conscious and panicking, the other which needed CPR, and we also practised using a defibrillator on a dummy. The weather was changeable, it was sunny, then windy, then back again, and for a brief period it rained, but then cleared up once more. 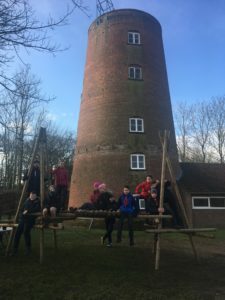 The hike was very well organised, with a method for helping a team if they got lost, and if a team did not reach a manned base for two hours they had to be called, with HQ being the Village Hall. Patrols Tiger, Cobra, and Falcon met at Maker Space on the 5th of February. We met a person who worked there, who then told us what we would be doing. 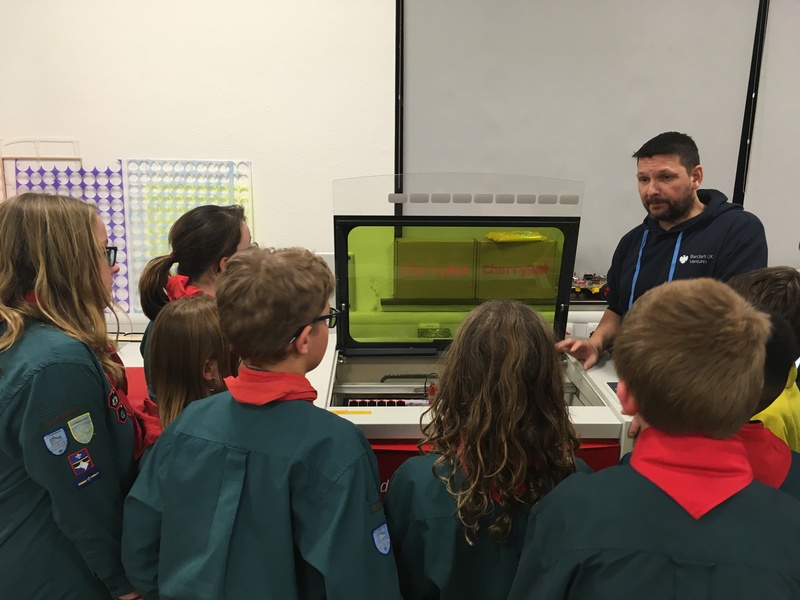 Firstly, he explained what rapid prototyping was – basically you build something and then test it – and that we would prototype a stamp. He showed us a 3D design Software called “123 design” and how to make 3D structures using it. We designed a handle for the stamp and also had a go to design something by ourselves. I designed a rocket. Then he showed us the 3D printer while it printed the handle, and the laser cutter making the rest of the stamp. The stamp had the Scout logo on it and then we put the handle onto the stamp and tested it using ink to stamp our “Certificates of Achievement”. He then gave us keyrings he had cut out of a sheet of orange see-through plastic with the laser cutter and used the laser cutter to engrave our names and the Scout logo. The week after, the other patrols visited Maker Space. On the 1st of February 2019 the Scouts met again at the train station in Cambridge to go on a trip to Roughton mill. We all arrived on time to get on the train to go to Norwich and then get a train to Cromer. We sat in 2 carriages and the girls had to have their own section!! So basically the leaders, boys and bags were all squished together. When we arrived at Cromer station we hiked 1km to the mill (we stayed in a converted Windmill by the way). When we arrived we had hot chocolate and brownies made by Ellis’s Mum. They were yummy and the hot chocolate was needed to warm us up!! Afterwards we spent our time relaxing and at 10 we went to sleep. We woke up to the smell of sausages and after a cooked breakfast we were ready for an exciting day ahead. We split up into 3 groups, one did outdoor pioneering. We had to build 2 A-frames with different types of lashings. It could hold at least 3 small people, so we did a good job there!!! The second group were learning about communicating on the sea, Danielle taught us about the phonetic alphabet which corresponded with certain symbols, e.g. the Scottish flag representing mike. Here’s my name using the phonetic alphabet : echo lima lima India sierra. After this we made flags and we held them up to communicate to the other team. The Scottish flag means my vessel is stopped. My favourite was film making. We did a short film then edited it and we put sound effects over some parts. Our group was good because of the moral of what to do or what not to do regarding stranger danger. 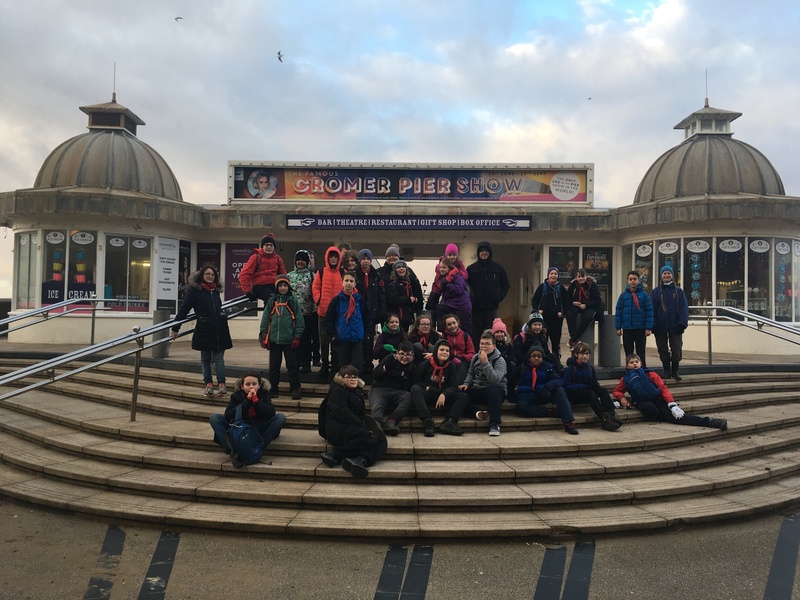 In the afternoon we hiked to Cromer, we went to the RNLI boat museum, it was really interesting and we also had the opportunity to try out different types of Morse code. After that, we went to the pier and chilled there for a bit. I was crazy … I bought an ice-cream and my fingers froze from it. After that we hiked back to the Windmill. For dinner we had vegetable curry and for pudding we had cake with custard. It was delicious!! The next morning after breakfast we finished off our activities. The weather was lovely and bright so we had our campfire during the day. We sat around the campfire reflecting on our fabulous weekend. We sang a lot of songs we also had marshmallows with hot chocolate. What a way to finish such a great camp!!! I can’t wait for next years winter camp. Older news items are available in our blog archive.